I know it's quite late to be posting this, but I'm going to write it nevertheless 😂. 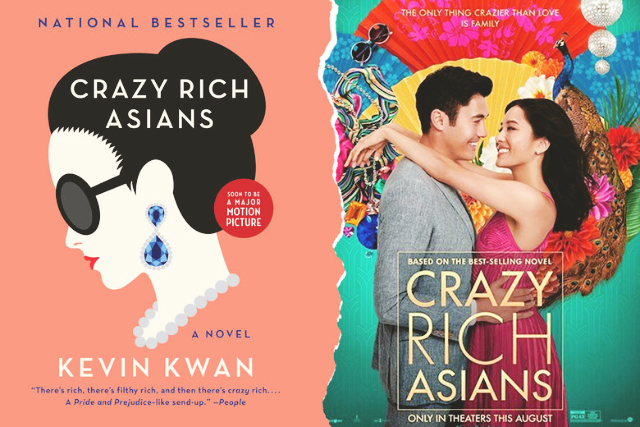 I actually watched Crazy Rich Asians twice; the first time with my boyfriend and the second time with my parents. To be honest, I originally planned on reading the book first before going to watch the movie. But since the book is quite lengthy, I decided to just directly watch the movie 😂. I'd have to say, the movie is very pleasant and easy to watch—because you don't have to think too much about it. For the most part, the story line is pretty cliché and predictable; but it's still enjoyable for me personally. In this review I'm going to review some of my favorite parts from the movie. Hopefully I won't spoil too much for those who haven't seen it yet 😉. "These people aren’t just rich, they’re crazy rich." 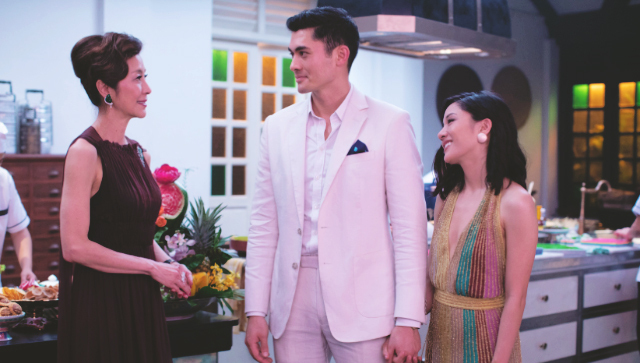 At the start of the movie, we are introduced to the Young family; a Chinese family from Singapore who were belittled at a private hotel in London. The prologue ends by showing how rich and powerful the Young family is—because they are able to take over the hotel with just a single phone call. Years later, we are introduced to the now adult Nick Young, who is currently living in New York together with his girlfriend, Rachel Chu. Rachel is an American-born Chinese who currently works as an economics professor at NYU. And the truth is, she didn't know that Nick is the son of an extremely rich family until he asked her to go to Singapore to meet his family. Basically the story revolves around Rachel trying to get to know and fit into Nick's crazy rich family. And just like many other romantic comedy movies, there will be competitions and heartbreaks throughout the story. The first thing that caught my attention when I started watching the movie is the music! I adore the Chinese music blended with a touch of Hollywood. It feels classic yet modern at the same time ❤️. I also love the color scheme, the setting, the clothes—everything feels so relatable because I myself am an Indonesian-born Chinese. There are a lot of Chinese culture and stereotypes all over the movie, which can be fun and entertaining to watch since most of them are indeed true until this day. Now I'm going to start talking about some of my favorite parts of the movie. First, I absolutely have to mention how much I love Astrid Leong-Teo (played by Gemma Chan). Her character is so amazing and I think Gemma Chan represents Astrid extremely well. Astrid exudes elegance that I truly admire 😍. The way she walks and talks perfectly shows it. Astrid is Nick's cousin and has quite her own story in this movie because she is married with a not-so-rich guy, Michael. I won't explain how the story goes in this review to avoid spoilers, but it's quite a sad story and I feel bad for Astrid. Even so, I think it's the best decision that she could make. Good for you, Astrid. "She just think you're some like unrefined banana. Yellow on the outside, and white on the inside." Next character that I really like is Eleanor Young (played by Michelle Yeoh), the typical Chinese parent who wants to control their child's life 😂. I think a lot of Chinese parents will be able to relate with her character on a deeper level, because even though she might seem controlling, she does everything out of love for her child. I'm really happy because Eleanor's character is played by an incredible actress like Michelle Yeoh. Her gestures and facial expression totally depicts what Eleanor is feeling without her saying anything. I think it takes a great actress to be able to do that. The last character that I'm going to discuss in this review will be Goh Peik Lin (played by Awkwafina). She is the comic relief of this movie. Scenes with her are just so much fun to watch and I love her friendship with Rachel. Her appearance on-screen always managed to make me laugh out loud 😂. As for my favorite scenes, I actually have a few. The first one that I want to mention is the scene at Newton Food Centre Singapore, when Nick and Rachel just arrived and went to eat there with friends. This scene makes me drool sooo baddd 🤤. I dream of the chicken satay, the chilli crab, and many more delicious food. I hope one day I can visit that place and try out Nick Young's favorite food 😂. My second favorite scene is towards the ending when Rachel and Eleanor played mahjong together. I actually have no idea how to play mahjong (which is such a shame, because I think it's a huge element of that particular scene), but I really admire what Rachel said to Eleanor there. Not going to spoil anything, you just have to watch it yourself 😉. Overall, it's a pretty decent movie especially if you love romantic comedies. The main characters are likable; Nick Young (played by Henry Golding) is presented well—he's the dreamy guy that's all-round perfect which makes him a bit less interesting than the other characters 🤔. But I like seeing his face on-screen and he's such an eye candy 😂. I'd have to say Henry Golding did a great job since this is his first time starring in a movie. Rachel Chu (played by Constance Wu) is the image of a strong independent woman who's smart, charismatic, and doesn't let people look down on her. Even though I've never seen Constance Wu acted on screen before, I thoroughly enjoyed her acting in this one. I'm curious if the sequel is going to be adapted into a movie as well or not, because I'm eager to see the continuation of Astrid's story 😆. I might decide to read the book some time in the future, hopefully it will be a fun and light-read.